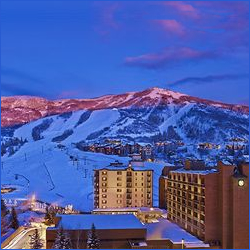 Book a stay at the slopeside Sheraton Steamboat Resort in beautiful Steamboat Springs, Colorado. Book early to receive the best pricing available – great lodging deals await just visit this link to find Sheraton Steamboat Resort Discounts. The Sheraton Steamboat Resort has arguably one of the best locations in Steamboat Springs Colorado when it comes to skiing and slope side activities. With great dining and spa amenities, as well all the year round activities the Steamboat Springs area has to offer, your stay in Steamboat Springs will be a wonderful and relaxing getaway.